So talk to me, Colby Sharp. And the rest of the Internet. I read I Want My Hat Back last night in Barnes and Noble while we were en route to see Hugo. 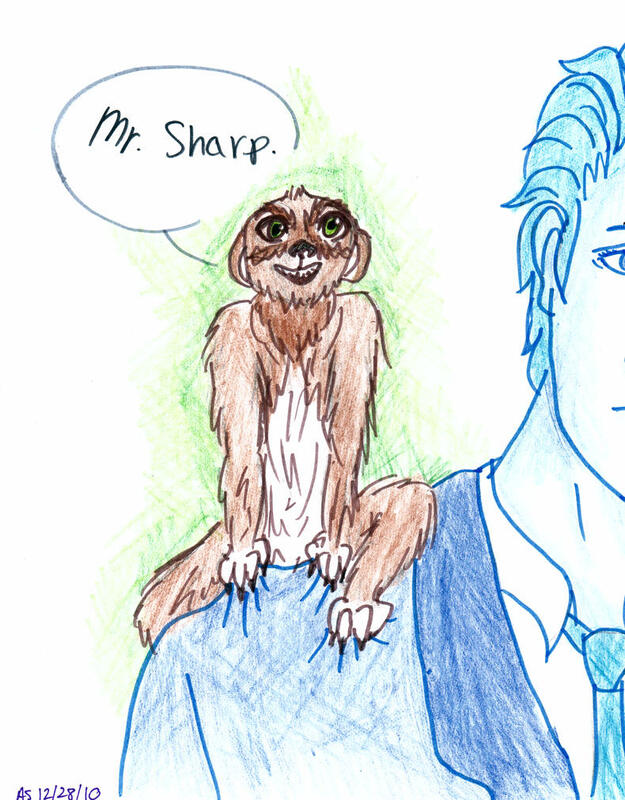 Mr. Sharp is frankly the driving force behind my eagerness to read #hatback, and he has long been a Team Bear proponent. Although I feel similarly to the person on Twitter (help me, I can’t find her tweet) who said both Bear and Rabbit were poorly behaved, I don’t think I should sit on the fence on this issue. So I began a list of pros and cons for each team. Spoiler alert and such regarding the content below. I’ve chosen to use genderless pronouns in this debate. I checked to see if my style guide of choice (the AP Stylebook) had weighed in on genderless pronouns, but it seems they haven’t really. So I’ve gone with my personal favorite gender-neutral pronoun, “per,” which I first learned about in Marge Piercy’s Woman on the Edge of Time. I HATE it when people mess with me. I feel Bear’s pain to a certain extent. Bear went through the appropriate channels to find per hat before resorting to what were PERHAPS unsavory measures — per searched high and low through the forest. My initial impression of Bear is that per is rather simple. Is Rabbit taking advantage of a cognitively compromised character? We don’t know what happened right before the end. Perhaps Bear contacted the authorities, who safely removed Rabbit from the forest and returned the hat to its rightful owner. Similarly, maybe Bear is just sitting on Rabbit. Or maybe per tried one of Kelso’s Choices and made a deal. If that’s the case, maybe Bear is mimicking Rabbit’s protests ironically at the end. Like, SEE, I could have been a jerk like Rabbit was, but I did the right thing AND got my hat back. Rabbit must know that its odds aren’t too good in the forest food chain. So maybe per decided to BUCK THE SYSTEM and mess with bear, sacrificing per existence to mess with The Man. Eye for an Eye. Maybe Bear munched on Rabbit’s friend/lover/cousin in the past. WE DON”T KNOW the backstory. How did bear misplace per hat in the first place? If Rabbit innocently happened upon the hat, per might not have realized that it was Bear’s. Maybe Rabbit’s frantic, verbose, seemingly guilty response is due to being TOTALLY FREAKED OUT that a bear is questioning per. Dare I suggest that joining Team Bear be a little bit of victim-blaming? I’m not completely convinced that the fox wasn’t somehow a part of this whole mess. I’m currently leaning toward Team Rabbit. Which is where I seek your counsel, MISter Sharp et al. 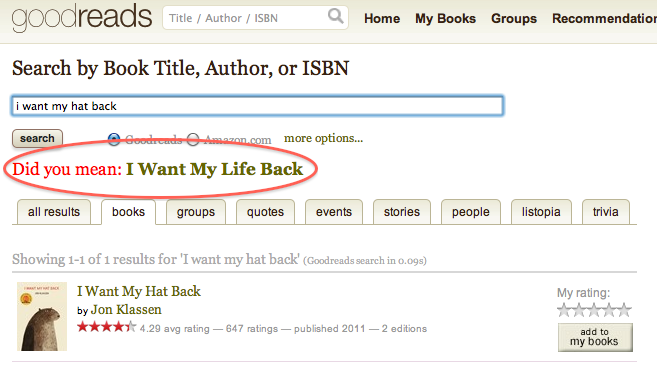 Also, ouch, GoodReads. I thought we had an understanding. Author shannonPosted on November 26, 2011 November 26, 2011 Categories Caldecotts/Mock Caldecotts, Inspiration, Literacy, PersonalTags hat back, literacy, reading, team bear, team rabbit4 Comments on I’m Bringing Hats Back.